A dozen tech startups involved in mobility, software, cybersecurity, robotics and smart payment terminals each raised $100 million or more in November. That $100 million figure came most often from SoftBank’s Vision Fund, a Japanese-based fund that is also backed by big investors such as Apple, Abu Dhabi’s government, and famously the Kingdom of Saudi Arabia as a way to diversify its energy-based economy. The Vision Fund in November invested $1.1 billion in View Inc., a developer of dynamic glass and smart windows. The startup, based in Milpitas, Calif., aims to improve the energy efficiency of buildings with glass that can be darkened and lightened, depending on weather conditions. The company also touts its product as promoting the mental and physical wellbeing of patients, residents and workers by reducing drowsiness, eyestrain and headaches. The SoftBank Vision Fund also invested $300 million in Automation Anywhere, a provider of robotic process automation software that raised $250 million from other investors at midyear. Robotic process automation (RPA) is captivating private investors. The software aims at automating mundane, repetitive back-office tasks that are normally handled by human beings, such as entering figures. Another RPA vendor, UiPath, this month added $40 million to its Series C round of private funding, bringing the round’s new total to $265 million. Early this year, the company raised $153 million in its Series B funding. Established in 2015, UiPath has taken in $448 million from investors. France’s BlaBlaCar, a carpooling and ride-hailing service, has raised a total of $448.5 million from private investors. It just got $114 million from SNCF (the French national railway company), Insight Venture Partners and other investors. Twelve big investments total $3.12 billion. And there may be more gigantic investments on the way before the end of 2018. Reuters reported in early November that SoftBank Group is leading a funding round for Hellobike, a bicycle-sharing company in China, for more than $400 million, according to people with knowledge of the matter. Primavera Capital, a Chinese private equity firm, and other investors are reportedly involved in the big round. Hellobike is valued at more than $2 billion. While mobility technology figures in three of the nine-figure investments, cybersecurity was represented once among the big funding rounds. Netskope of Santa Clara, Calif., pulled down $168.7 million in its latest round, bringing its total private funding to about $400 million in six rounds. The company is now valued at more than $1 billion. Lightspeed Venture Partners, an existing investor, led the latest round. Other backers are Accel, Base Partners (a new investor), Geodesic Capital, Iconiq Capital, Sapphire Ventures and Social Capital. Netskope secures cloud infrastructure, data and Web applications from breaches. Founded in 2012, the company has 610 employees with offices in Australia, India, and the United Kingdom, in addition to the United States. Netskope made its first acquisition this year, purchasing Sift Security, a startup specializing in cloud infrastructure cybersecurity utilizing machine learning. Sift had Amazon Web Services, Google Cloud, and Microsoft Azure among its customers. While Netskope was the only cybersecurity company with a nine-figure investment, several other cybersecurity startups won funding in November. Dragos of Hanover, Md., raised $37 million in Series B funding led by Canaan Partners, which contributed $21 million. Energy Impact Partners, AllegisCyber, and DataTribe, all existing investors, together put in $15 million. The remaining $1 million came from Emerson Electric, Schweitzer Engineering Labs and National Grid’s new venture capital arm. The three co-founders of Dragos all worked at the National Security Agency. Dragos CEO Robert M. Lee also previously worked at the U.S. Cyber Command. Dragos specializes in securing industrial control systems (ICS), an area that interested few venture capitalists in 2016, when the company was started. ICS cybersecurity has become a hot field since then. Meanwhile, Shape Security of Mountain View, Calif., received $26 million in Series E funding led by Norwest Venture Partners, bringing its total private funding to more than $130 million. Kleiner Perkins, Allegis Capital, JetBlue Ventures, Singtel and others joined the round. PitchBook estimates the company’s valuation at $495 million. Shape’s specialty is fighting off imitation attacks—fraudulent attempts to gain access to sensitive data through malware and stolen logins. It uses artificial intelligence technology to detect and respond to cyberattacks. The startup will use the new funds to expand its international reach into Asia and the EMEA region through its offices in Australia and the U.K.
Israel’s XM Cyber raised $22 million in Series A funding, bringing its total private funding to $32 million. Investing in the latest round were Macquarie Capital, Nasdaq Ventures, Our Innovation Fund, UST Global and other backers. The startup provides a fully automated advanced persistent threat simulation and remediation platform. XM Cyber has offices in Australia, the U.K. and the U.S., in addition to Israel. Also based in Israel is SAM, which offers cybersecurity protection for home routers and devices connected to them. The startup received $12 million in Series A funding led by Intel Capital. Also participating were ADT, NightDragon and Blumberg Capital. SAM came out of stealth mode in February of this year with $4 million funding from Team8 and other investors. ISARA of Waterloo, Ontario, raised $10 million in Series A funding led by Shasta Ventures. Quantum Valley Investments previously put $11.5 million into the Canadian cybersecurity startup. The company says it is developing “production-ready quantum-safe security solutions for today’s computing ecosystem.” ISARA counts Cisco Systems, DigiCert, Gemalto and Volkswagen among its partners and customers. Back to Israel—Votiro Cybersec Global received an $8 million investment from Australia’s Senetas Corp. Ltd. Tel Aviv-based Votiro offers content disarm and reconstruction technology. Its cybersecurity software guards against zero-day exploits and other cyberthreats. Alcide of Tel Aviv, Israel, raised $7 million in Series A funding led by CE Ventures, which was joined by existing investors Intel Capital and Elron. The startup received an initial seed round of $5.2 million last December. It introduced its cloud-native security platform in April. In May, the company was named a Gartner Cool Vendor for Cloud Security. Yet another Israeli cybersecurity company, Duality Technologies, received a $4 million investment from the Team8 cybersecurity fund. Semiconductor startups were in the money during November, too. Habana Labs of Tel Aviv and San Jose, Calif., raised $75 million in Series B funding led by Intel Capital, which was joined by WRV Capital, Bessemer Venture Partners, Battery Ventures, and other investors. The developer of AI processors has raised a total of $120 million from private investors. Microchip startups often require buckets of cash to get them through years of IC design, development, and fabrication. Habana was founded in 2016 and plans to sample its training processor silicon during the second quarter of 2019. Linse Capital and Oppenheimer Asset Management invested $63 million in Valens of Hod HaSharon, Israel. The company’s Valens Automotive division, founded in 2015, develops HDBaseT technology chipsets for automotive applications. Valens raised $60 million last year. The company will be demonstrating its chipset at CES 2019 in January. Spin Memory of Fremont, Calif., raised $52 million in Series B funding led by Applied Ventures, the venture-capital arm of Applied Materials, and by Arm. Allied Minds, Woodford Investment Management and Invesco Asset Management contributed $23 million of the round through exercising convertible securities. Formerly known as Spin Transfer Technologies, the startup is a developer of magnetoresistive random-access memory intellectual property. Along with its investment, Arm licensed Spin Memory’s Endurance Engine technology and related IP. The startup in 2012 received $36 million in Series A funding from Allied Minds and Invesco. Switzerland-based aiCTX received $1.5 million in pre-Series A funding from Baidu Ventures. The startup will use the money to develop commercial applications for its low-power neuromorphic computing and processor designs. Founded in 2017, aiCTX bases its full-stack custom neuromorphic processors on technology developed at the University of Zurich’s Institute of Neuroinformatics and at ETH Zurich. Automotive technology was another focus of private investors in November. Phoenix-based Nikola Motor’s Series C funding topped out at $205 million with $105 million received during November. The electric vehicle company is rolling out its Nikola Tre hydrogen-powered semi-truck and has received more than $380 million in orders for the truck. DeepMap of Palo Alto, Calif., raised $60 million in Series B funding, valuing the two-year-old company at $475 million. It raised $25 million last year. DeepMap is developing high-definition maps for autonomous vehicles. Its backers include Generation Investment Management, Nvidia, Robert Bosch Venture Capital, Andreesen Horowitz, Accel, and GSR Ventures. Pleasanton, Calif.-based AEye, a developer of LiDAR technology, received $40 million in Series B funding led by Taiwania Capital, the investment firm created and backed by Taiwan’s National Development Council. 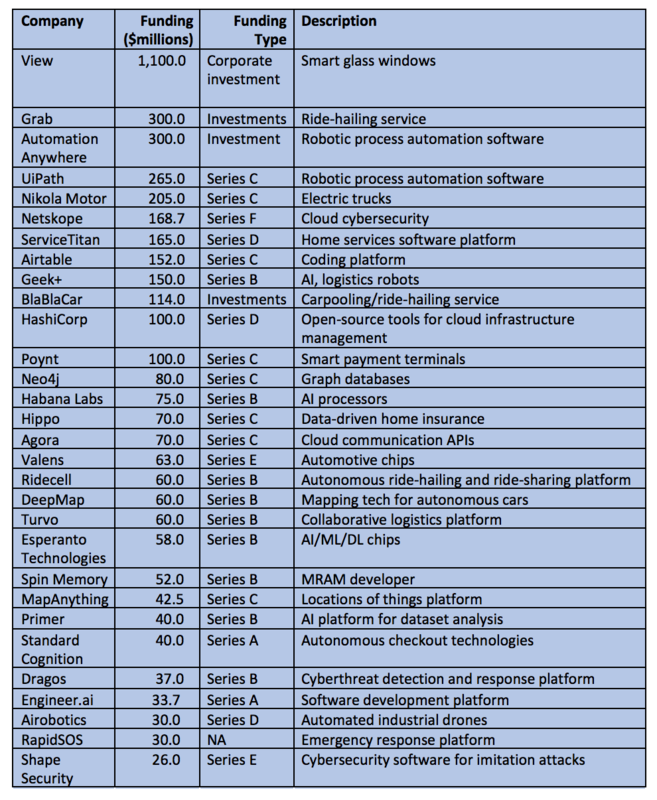 Kleiner Perkins, Intel Capital, Airbus Ventures, and Tychee Partners also participated in the funding round. Two former Bosch engineers started Apex.AI of Palo Alto. Their startup just got $15.5 million in funding from Canaan Partners and Lightspeed Venture Partners. The company came out of stealth mode to announce its development of software for autonomous vehicles, representing a version of the Robot Operating System for open-source robotics middleware. Tel Aviv-based Guardian Optical Technologies received $2.5 million in private funding led by Union Ventures and including B&E Equities and other private investors, extending an earlier funding round led by Mirai Creation Fund, which is backed by Toyota Motor. Guardian offers computer vision technology for an in-car platform that keeps track of passengers and objects in the vehicle. Its sensors simultaneously capture high-definition video and 3D depth mapping. Finally, there’s Israel’s Quantum Machines startup, which raised $5.5 million in seed funding led by Battery Ventures and TLV Partners. The company works on infrastructure for quantum computing, a theoretical technology that is being pursued by many big tech companies. Tomorrow’s vehicle-to-infrastructure network will require a coordinated effort between standards bodies, infrastructure providers, and technology developers. Why sensor data needs to be cleaned, and why that has broad implications for every aspect of system design.